“Circolare” is Pino Forastiere’s second solo acoustic guitar album (Accordature Aperte, 2005) published two years after the first record “Rag Tap Boom”. After “Rag Tap Boom”’s raid in the world of rock, Forastiere’s acoustic guitar moves southwards, goes back in time and discovers the worth of melody. The result is a story, a kind of ‘concept album’. 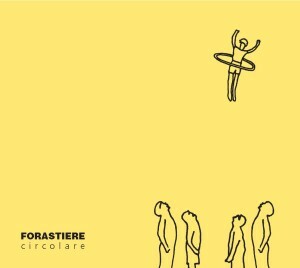 “Circolare” might be called more ‘Italian’ than the first one; its most profound musical influence has Latin roots. The track “Nordamerica”, despite its title, hides a Brazilian forro’s rhythm.“Moresco”, the final piece both of the record and of an ideal Mediterranean Suite featuring the last four pieces, acquires a Middle East tinge, which can be perceived very often in southern Italy’s popular music. The longest and most complex piece of the album, “Dominic”, is dedicated to the talent of the guitarist-composer Dominic Frasca, New York experimentalist of the minimalist scene. “Circolare” and “Lo gnomo” come from an ironic and affectionate revision of classical guitar literature. “In.Out.” and “Ripresa” are two ballads, while “Intro” and “Full” are a rock tribute. The music is something like a mix of Steve Reich’s interlocking rhythmic patterns meet Michael Hedges’ techniques, all while admiring Eddie Van Halen. John Schaefer, New Sounds, WNYC Radio.